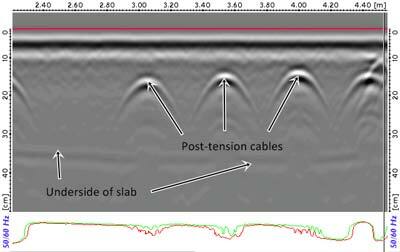 Post-tension and pre-tensioned (PT) cables are commonly used in concrete construction to facilitate thinner slabs and greater span lengths between support columns. These PT cables, comprised of steel wires inserted into a metallic sheath, are subsequently ‘tensioned’ and grouted after the concrete is poured. A Sydney construction company needed to cut a 4m x 5m penetration in a suspended slab for a new escalator. 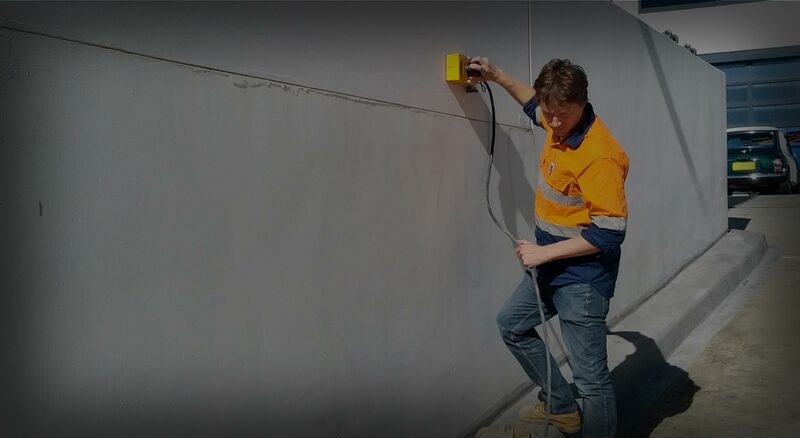 Wanting to avoid hitting PT cables, they called Concrete Scanning Services to conduct a slab survey in order to detect and mark the existing PT cables. The tremendous cable tension makes cutting a cable dangerous for the operator and compromises the structure’s integrity. GPR can accurately and quickly locate and identify PT cables embedded in concrete. Unique properties of PT cables allow ground penetrating radar (GPR) concrete imaging to identify these features with more certainty and accuracy. In GPR images, these attributes indicate patterns for our experts to assess. Differentiating a PT cable from steel reinforcement generally requires a larger area to be scanned to fully understand the layout of all structural elements in the slab. Our GPR scan of the slab detected and marked 3 x 4 perpendicular PT cables at 1400mm spacing in the scan area for the proposed slab penetration. The survey was completed quickly and the detailed results presented in real time and marked in situ clearly with line marker. The client could then truncate the PT cables and safely cut the slab for the new escalator opening.